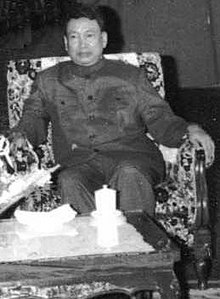 Saloth Sar (better known as Pol Pot; January 25, 1925 – April 15, 1998) was the leader of Cambodia between 1975 and 1979. He was the leader of a group called the Khmer Rouge, a group of peasant revolutionaries who turned Cambodia into a military dictatorship officially called Democratic Kampuchea. Between 1.7 and 2.2 million Cambodians were killed by his regime. Pol Pot was thrown out of power in January, 1979, when the Vietnamese Communists liberated Kampuchea. Pol Pot's family was a good family, and really connected with the royal family. His brother, Loth Suong, was a palace clerk, and his cousin was a wife to Prince Sisowat Monivong and had a son named Kossarak. His connection helped him get a scholarship to France. His father's name was Pen Saloth and his mother's name was Sok Nem. Pol Pot had eight siblings. His family was thriving, but alone. Pol Pot's childhood was fairly normal. Pol Pot's real name is Saloth Sar. No one knows his real birthday, but two guesses are 1925 or May 25, 1928. He grew up in a nice place, and his village was about two miles from Kompong Thom's capital. Kompong Thom was a province of Cambodia. Back then, that part of Cambodia was part of France. In 1949, he went to France and studied about radio electronics, but got distracted and led astray because of Marxism, which is a form of communism. He didn't study, and his scholarship was taken away. In 1953, he went back to Cambodia and became a communist. The following year, Cambodia became free from France. In 1962, he became the leader of the Communist party in Cambodia. This party was hidden, as the prince, Prince Sihanouk, did not like Pol Pot nor the Communists. Pol Pot went to the jungle and created a guerrilla force called the Khmer Rouge (the Khmer are the main ethnic group in Cambodia, and rouge is French for "red", the colour of Communism). The Khmer Rouge was made of mostly teenagers. Guerilla means that they hid and ambushed people, rather than be visible and directly attack their enemies. They were the source of Pol Pot's power. In 1969-1973 the U.S. bombed Cambodian sanctuaries attempting to get rid of the North Vietnamese, but only drove them deeper into the country. The US also made it so that the peasants ran to cities. In 1970, the U.S. got rid of Prince Sihanouk and unknowingly made Pol Pot more popular. They also made Prince Sihanouk mad, and so he joined Pol Pot, but that alliance only gave Pol Pot an advantage. This created a whole lot of confusion, and only made Pol Pot even more popular. On April 17, 1975, Pol Pot went into Phnom Penh, the capital, and took control. He planned for a "super great leap forward", inspired by Mao's Great Leap Forward in China. The second in command, Noun Chea, also called Brother Number Two, said later that the mass killing was a mistake. Pol Pot took all the city people and drove them towards fields, where they worked incessantly. A lot of people died on the way to the fields. Even more died in the fields from hunger, thirst, overwork, and sickness. They would only get a 180-gram can of rice every day, and they were harvesting fruits and rice. Every tenth day was a rest day, and so were the festivals. The government took over anything that had to do with money. Religion was illegal. Teenagers had to be part of the army and children learned how to set mines and make traps. People getting together were not allowed. Only two people or less were allowed to see each other. Marriages were arranged, not because they loved each other, but because they were forced to. They had to marry in big groups. The worst part is that Pol Pot didn't know that he was doing bad things. After the Vietnamese and underground Cambodian parties got Pol Pot out of power on 7 January 1979, he went to a zone near Thailand called Pailin and tried to get control of Cambodia again. Eventually the Khmer Rouge broke up in the early 1990s. On the evening of April 15, 1998, just 2 days before anniversary of Khmer Rouge's takeover of Cambodia, on April 17 1975, Pol Pot died of a possible heart attack, in the woods, never admitting that he did anything wrong to Cambodian people. It has been said that Pol Pot killed himself with poison to avoid trial. On his death face, there were signs of suffering, with his one eye open. Pol Pot was cremated without any ceremony or fanfare. After he died, some people started praying to him, like he was a god. Some even dug up parts of his bone and took them away like special amulets and charms. Remnants of Khmer Rouge regime in Cambodia still support Pol Pot. ↑ Chandler, David (23 August 1999). "Pol Pot". Time Magazine. Archived from the original on February 3, 2011. Retrieved 4 February 2011. Nguyen Thi Dieu. Pol Pot. World Book Advanced. World Book, 2012. Web. 20 Nov. 2012. FRONTLINE/WORLD. "Cambodia - Pol Pot's Shadow". The Story. PBS, n.d. Web. 20 Nov. 2012. The History Place, "Genocide in the 20th Century". The History Place, n.d. Web. 2 Oct. 2012. This page was last changed on 27 January 2019, at 13:57.